When we get older we often think back to the special little moments in our lives growing up. The moments that are often the most special are the ones that are repeated often. In addition they are often the ones that are the simplest. What are traditions? The dictionary describes it as “the transmission of customs or beliefs from generation to generation.” When you put it that way we can now see the importance of this issue in families. There is a problem with traditions though when the nuclear family gets dissolved through divorce. Often these traditions are either stopped completely, or continue different sometimes through one parent only. This can be very disruptive to children for sure. Especially when the traditions are changed it can even create some animosity toward the parent not involved in the tradition any longer and even worse the new parent that comes into the new situation. Developing new traditions are important. Unfortunately we as stepparents will often not engage in anything new or stop something when we meet resistance from the child. There is no doubt this is difficult and we can often justify shutting something down, but we should try to push through this resistance. I have some fond memories of small traditions that were built by my parents after the divorce I went through as a child. For one my father often when he picked me up on Fridays to go to his house for the weekend, would do something special that I still remember to this day. Back then, packs of Star Wars or Baseball cards were something like 25 cents a pack. He would buy me 4 at a time, and I think he may have given me the dollar to pay for the cards with the clerk. I remember spending lots of time looking through the cards, sorting them, reading through the information and especially learning the baseball statistics on the back. Some parents might say this is spoiling a child in that they come to expect something everytime something happens. However, as in the example above it does not have to be anything that extravagant. In fact it doesn’t necessarily have to be anything that really costs money or something that is a material good. I remember another tradition that involved Christmas and this one was with my Dad and Stepmom as well. Around Christmas time after the Christmas tree was put up, decorated and lit up, my stepbrothers and I would ask to sleep out in front of it for at least one night during the Christmas season. It was such a joy to wake up in the middle of the night to see the warm glow of lights. Forty years later this is still such a special memory. In fact this was one that I carried on with my own daughter as she grew up. 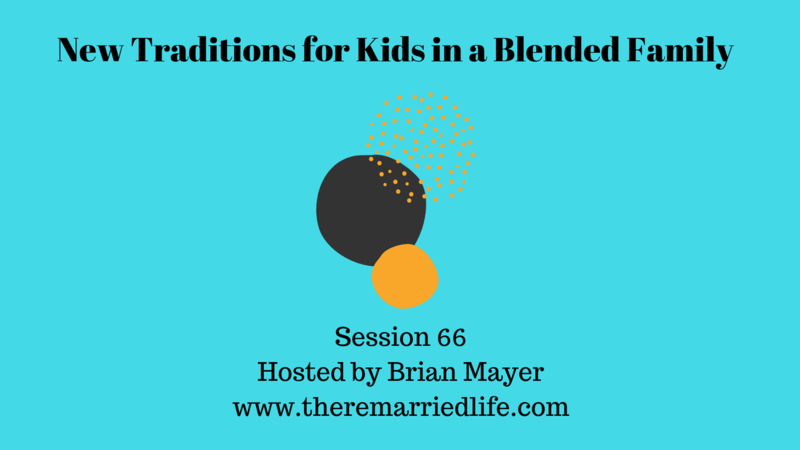 What kind of traditions are you building in your stepfamily? Is there a fear in starting something? Have you started something only to have it be met with lots of criticism. If it helps, I grew up as I have said in the homes of divorced parents and to be sure I am sure I verbally criticized and mentally critized lots of things that were done in both families. However looking back those things I criticized were actually things I grew to love and appreciate as I got older. Ever heard the verse Proverbs 22:6 which says “Train up a child in the way he should go: and when he is old, he will not depart from it.” You can of course apply this to lots of things like discipline but I think you can also apply it to traditions. The key part of this verse is “when he is old.” This means that it is possible and probably liking that your child will reject what you are doing for a time but eventually they will come back to it and do this with their own children. So again the message is do something for your stepkids in light of a longer term view. Develop something around leaving and coming back together such as the cards idea. I always remember having waffles as the morning breakfast when I would leave my father’s house on Monday mornings. Develop something for the kids that they can come to expect and enjoy during this transition time. Around the dinner table, ask everyone to talk about 3 things – what is something that happened that day, what is one thing they fear coming up, and what is one thing they are looking forward to. This will help them know that you are encouraging and listening and not just their to correct and discipline. One day a week allow your child to wear clothes that don’t match. This will be tough for those of you that are somewhat obsessive compulsive and have some anxiety about the desire to control how the kids are viewed. To be sure some people will wonder what is going on, but you can tell your kids to let people know that one day a week they can decide. Of course when kids get older they will begin to make their own choices but this will help the younger kids. For the older kids especially the ones that can drive, maybe allowing them to drive the family to dinner out every Friday night could be something fun that they will always remember. These are just a few examples of some traditions. Take these ideas and morph them into your own or maybe go in a completely different direction. You get the idea! Don’t forget to join the Facebook group by going to the show notes and sharing your new traditions and how they are going and being received. ​As always remember that marriage is not something you have, it is something you do. Talk to you next week unless you are binge listening in the future in which case I will talk to you in about a minute! Take care.